Jennifer Nielsen has done it again, ya'll! She's delivered another intriguing installment to The Ascendence Trilogy. I wasn't sure what to expect this time around, but I have to say I'm impressed. Nielsen gives us another dose of what made us fall in love with The False Prince but with a whole new set of complications. Jaron/Sage is back, and more frustrating than ever. Not going to lie, Jaron's rash-thinking and thick-headed reasoning are what make his character brilliant. Doesn't make him any less frustrating though, and he pushed my patience to the brink this time! 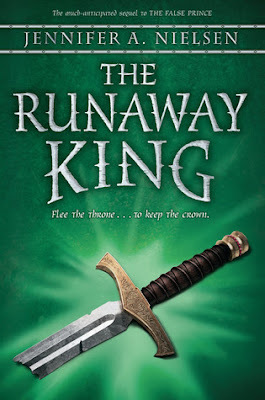 After a former friend tries to kill him, Jaron must flee his kingdom and go into hiding. But of course, Jaron doesn't go into hiding. Instead, he walks right into enemy territory like the arrogant little prat he is with fingers crossed that his shoddy plans to save his kingdom pan out! All I could do was groan. But that's Jaron, and I love him. We meet other characters from the previous book like, Amarinda, Imogen, Tobias, and Mott. Mott was the only other one besides Jaron that I really liked from The False Prince but by the end of this one, I had a new respect for all of them. I really don't understand this "romance" between Jaron and Imogen, but since this is a middle grade book, I suspect it won't ever become some huge thing (It's already hovering on the edge of the dreaded "love triangle" territory and that's enough for me). The only reason this book isn't 5 STARS is because of the action. The intrigue is all there, but it lacks the action to back it up. I mean, there are bloody PIRATES in the book! I needed more swashbucklin' and less chatter. Nevertheless, I couldn't give it lower than a 4.5 rating because the plot was just too good. And the ending? It was a cliffhanger, but I can deal with a cliffhanger like that. I'm too excited for the next book! "So you joined up with the pirates? I couldn't imagine anyone but the ladies' knitting club accepting you."